We picked up our CSA box yesterday; it was full of an assortment of vegetables and fruit and even a very tasty watermelon. 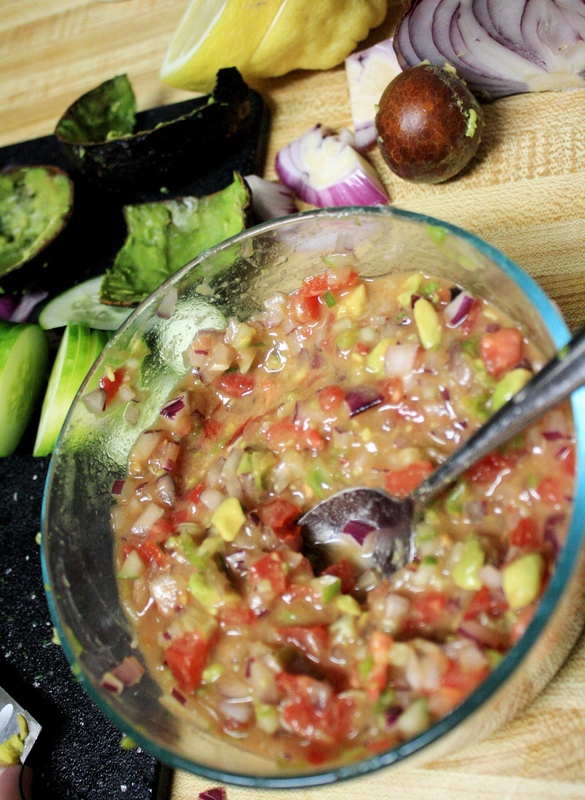 The weekly newsletter included two recipes for gazpacho. I’ve never made gazpacho before, but it seemed like a great way to use several different vegetables at once. There was a recipe for Watermelon Gazpacho from All Recipes, and a recipe for Gazpacho Soup from Raw Foods Diet Center. The Watermelon Gazpacho had a lot more ingredients so I decided to try the Gazpacho Soup. Either chop and mix all ingredients or pulse in a food processor until desired chunkiness is achieved. Pour into a bowl and garnish with a few cilantro leaves. Seems easy enough right? Well, I have an abundance of everything but cilantro. I really need to buy a cilantro plant. It seems that so often this summer I have wanted to try out a recipe or make salsa and then I realize that I don’t have cilantro. I chopped everything into small pieces and mixed it all up. The peppers added just the right amount of spice. I only added a half of a cucumber because I’m not a huge fan. The half of the cucumber was the perfect amount for me – it was still refreshing without being over powering. I’m sure you could make gazpacho with anything you had on hand. The watermelon gazpacho had garlic, orange juice, bell pepper, and fresh herbs. If you mix the ingredients with a food processor and add more liquid it would make a lovely gazpacho soup as well. Anyone have their favorite gazpacho recipe? Part of the Food Renegade Blog! Follow the link for lots of real food recipes and information.